AIEF is proud to support its growing network of alumni to pursue productive careers and fulfilling lives. Information about alumni from graduating classes 2008-2017 follows. Information about students attending school and university in 2018, including the graduating class of 2018, can be found here under their individual schools. Jacob from Ayr graduated from James Cook University in the field of Geology on an AIEF-BHP Tertiary Scholarship in 2018. Jacob is currently working in Mining and Resources. Torey from Derby graduated from The University of Western Australia on an AIEF-BHP Tertiary Scholarship in 2018. Torey is currently working in Energy, Mining and Resources. Corey from Lake Illawara graduated from The University of Wollongong in the field of Civil and Mining Engineering on an AIEF-BHP Tertiary Scholarship in 2018. Corey is currently working in Civil Engineering. Teale from Kirrawee graduated from Queensland University of Technology on an AIEF-BHP Tertiary Scholarship in 2018. Teale is currently working in Energy, Mining and Resources. Carter from Port Macquarie graduated from The University of Newcastle on an AIEF-BHP Tertiary Scholarship in 2017. Carter is currently working in Engineering at BHP. Shahbaz from Perth graduated from The University of Western Australia on an AIEF-BHP Tertiary Scholarship in 2017. Shahbaz is currently working in Engineering at BHP. Travis from Kalgoorlie graduated from The University of Western Australia on an AIEF-BHP Tertiary Scholarship in 2017. Travis is currently working in Energy, Mining and Resources at BHP. Balin from Kempsey graduated from The University of New South Wales on an AIEF-BHP Tertiary Scholarship in 2017. Balin is currently working in Engineering at BHP. Gavin (Jarrod) Jarrod from Newman completed Year 12 on an AIEF Scholarship at Aquinas College in 2017. Jarrod is currently working in Sports and Recreation. Natasha from Cunnamulla completed Year 12 on an AIEF Scholarship at Clayfield College in 2017. Natasha is currently working in Early Childhood Education. Danella from Moa Island completed Year 12 on an AIEF Scholarship at Clayfield College in 2017. Danella is currently studying at University in the field of Health and Health Science. Zac from Tennant Creek completed Year 12 on an AIEF Scholarship at Ipswich Grammar School in 2017. Zac is currently studying at University in the field of Accounting, Business and Financial Services. Koiki from Yam Island completed Year 12 on an AIEF Scholarship at Ipswich Grammar School in 2017. Koiki is currently working in Construction. Ryley from Beaudesert completed Year 12 on an AIEF Scholarship at Ipswich Grammar School in 2017. Ryley is currently working in Hospitality and Tourism. Melekai from Mossman completed Year 12 on an AIEF Scholarship at Ipswich Grammar School in 2017. Melekai is currently working in Health and Health Science. Leon from Ipswich completed Year 12 on an AIEF Scholarship at Ipswich Grammar School in 2017. Leon is currently working in Defence. Jeremiah from Dauan Island completed Year 12 on an AIEF Scholarship at Ipswich Grammar School in 2017. Jeremiah is currently studying at TAFE in the field of Health and Health Science. Dhareese from Hope Vale completed Year 12 on an AIEF Scholarship at Ipswich Grammar School in 2017. Dhareese is currently working in Construction. Corey from Atherton completed Year 12 on an AIEF Scholarship at Ipswich Grammar School in 2017. Corey is currently working in Health and Health Science. Xavier from Hope Vale completed Year 12 on an AIEF Scholarship at Ipswich Grammar School in 2017. Xavier is currently working in Manufacturing. Timor from Badu Island completed Year 12 on an AIEF Scholarship at Ipswich Grammar School in 2017. Timor is currently studying at Registered Training Organisation in the field of Hospitality and Tourism. Rhys from Chinchilla completed Year 12 on an AIEF Scholarship at Ipswich Grammar School in 2017. Rhys is currently working in Engineering. Louis from Ipswich completed Year 12 on an AIEF Scholarship at Ipswich Grammar School in 2017. Louis is currently working in Retail, Consumer Products and Services. Joel from Shelburne completed Year 12 on an AIEF Scholarship at Ipswich Grammar School in 2017. Joel is currently working in Transport and Logistics. James from Charters Towers completed Year 12 on an AIEF Scholarship at Ipswich Grammar School in 2017. James is currently studying at University in the field of Creative Arts. Darren from Gympie completed Year 12 on an AIEF Scholarship at Ipswich Grammar School in 2017. Darren is currently working in Other Services. Rhiannon from Petersham completed Year 12 on an AIEF Scholarship at Kincoppal-Rose Bay School of the Sacred Heart in 2017. Rhiannon is currently working in Administration and Office Support. Kate from Cooma completed Year 12 on an AIEF Scholarship at Kincoppal-Rose Bay School of the Sacred Heart in 2017. Kate is currently working in Hospitality and Tourism. Olly from Dubbo completed Year 12 on an AIEF Scholarship at Knox Grammar School in 2017. Olly is currently studying at University in the field of Education. Beau from Worrigee completed Year 12 on an AIEF Scholarship at Knox Grammar School in 2017. Beau is currently studying at University in the field of Accounting, Business and Financial Services. Brianna from Port Hedland completed Year 12 on an AIEF Scholarship at La Salle College in 2017. Brianna is currently working in Retail, Consumer Products and Services. Georgia from Griffith completed Year 12 on an AIEF Scholarship at Loreto Normanhurst Limited in 2017. Georgia is currently working in Accounting, Business and Financial Services. Tristan from Banora Point completed Year 12 on an AIEF Scholarship at Marist College Ashgrove in 2017. Tristan is currently studying at University in the field of Accounting, Business and Financial Services. Raven from Cherbourg completed Year 12 on an AIEF Scholarship at Marist College Ashgrove in 2017. Raven is currently working in Hospitality and Tourism. Dean from Dandenong completed Year 12 on an AIEF Scholarship at Marist College Ashgrove in 2017. Dean is currently working in Construction. Rueben from Fitzgibbon completed Year 12 on an AIEF Scholarship at Marist College Ashgrove in 2017. Rueben is currently working in Construction. Jordan from Eli Waters completed Year 12 on an AIEF Scholarship at Marist College Ashgrove in 2017. Jordan is currently working in Construction. Braydon from Murgon completed Year 12 on an AIEF Scholarship at Marist College Ashgrove in 2017. Braydon is currently working in Sports and Recreation. Pat from Bairnsdale completed Year 12 on an AIEF Scholarship at Melbourne Grammar School in 2017. Pat is currently studying at TAFE in the field of Mathematics, Science and Research. Kahn from Bairnsdale completed Year 12 on an AIEF Scholarship at Melbourne Grammar School in 2017. Kahn is currently studying at University in the field of Arts and Social Science. Teegan from Darwin completed Year 12 on an AIEF Scholarship at Pymble Ladies' College in 2017. Teegan is currently studying at University in the field of Health and Health Science. Bridget from Holloway's Beach completed Year 12 on an AIEF Scholarship at Pymble Ladies' College in 2017. Bridget is currently studying at University in the field of Education. Chalali from Kowanyama completed Year 12 on an AIEF Scholarship at Pymble Ladies' College in 2017. Chalali is currently studying at University in the field of Farming, Agriculture and Aquaculture. Tremayne from Derby completed Year 12 on an AIEF Scholarship at Scotch College, Perth in 2017. Tremayne is currently working in Manufacturing. Jakheen from Broome completed Year 12 on an AIEF Scholarship at Scotch College, Perth in 2017. Jakheen is currently working in Retail, Consumer Products and Services. Tyrell from Kowanyama completed Year 12 on an AIEF Scholarship at St Augustine's College in 2017. Tyrell is currently studying at University in the field of Health and Health Science. Ronald from Yam Island completed Year 12 on an AIEF Scholarship at St Augustine's College in 2017. Ronald is currently working in Defence. Trent from Innisfail completed Year 12 on an AIEF Scholarship at St Augustine's College in 2017. Trent is currently working in Engineering. Cody from Alyangula completed Year 12 on an AIEF Scholarship at St Augustine's College in 2017. Cody is currently working in Hospitality and Tourism. Nikita from Wulagi completed Year 12 on an AIEF Scholarship at St Catherine's School, Waverley in 2017. Nikita is currently studying at University in the field of Arts and Social Science. Harry from Nowra completed Year 12 on an AIEF Scholarship at St Gregory's College Campbelltown in 2017. Harry is currently working in Education. Baylee from Gunnedah completed Year 12 on an AIEF Scholarship at St Gregory's College Campbelltown in 2017. Baylee is currently studying at University in the field of Law and Justice. Ethan from Tamworth completed Year 12 on an AIEF Scholarship at St Gregory's College Campbelltown in 2017. Ethan is currently working in Construction. Ashley from Dubbo completed Year 12 on an AIEF Scholarship at St Gregory's College Campbelltown in 2017. Ashley is currently working in Construction. Xavier from Chermside completed Year 12 on an AIEF Scholarship at St Joseph's Nudgee College in 2017. Xavier is currently working in Hospitality and Tourism. Sario from Thursday Island completed Year 12 on an AIEF Scholarship at St Joseph's Nudgee College in 2017. Sario is currently working in Retail, Consumer Products and Services. Robert from Goodooga completed Year 12 on an AIEF Scholarship at St Joseph's Nudgee College in 2017. Robert is currently working in Farming, Agriculture and Aquaculture. Jerry from Pormpuraaw completed Year 12 on an AIEF Scholarship at St Joseph's Nudgee College in 2017. Jerry is currently working in Farming, Agriculture and Aquaculture. Isaiah from Wynnum completed Year 12 on an AIEF Scholarship at St Joseph's Nudgee College in 2017. Isaiah is currently working in Farming, Agriculture and Aquaculture. Daniel from Darwin completed Year 12 on an AIEF Scholarship at St Joseph's Nudgee College in 2017. Daniel is currently studying at University in the field of Accounting, Business and Financial Services. Thomas from Gympie completed Year 12 on an AIEF Scholarship at St Joseph's Nudgee College in 2017. Thomas is currently studying at University in the field of Mathematics, Science and Research. Ryan from Charters Towers completed Year 12 on an AIEF Scholarship at St Joseph's Nudgee College in 2017. Ryan is currently studying at University in the field of Mathematics, Science and Research. Paddy from Lockhart (QLD) completed Year 12 on an AIEF Scholarship at St Joseph's Nudgee College in 2017. Paddy is currently working in Construction. Jakeel from Bribie Island completed Year 12 on an AIEF Scholarship at St Joseph's Nudgee College in 2017. Jakeel is currently working in Retail, Consumer Products and Services. Ethan from Groote Eylandt completed Year 12 on an AIEF Scholarship at St Joseph's Nudgee College in 2017. Ethan is currently working in Energy, Mining and Resources. Bailey from Wagga Wagga completed Year 12 on an AIEF Scholarship at St Joseph's Nudgee College in 2017. Bailey is currently working in Hospitality and Tourism. Tiko from Cairns completed Year 12 on an AIEF Scholarship at St Peters Lutheran College in 2017. Tiko is currently working in Construction. Sharnell from Cairns completed Year 12 on an AIEF Scholarship at St Peters Lutheran College in 2017. Sharnell is currently working in Early Childhood Education. Bradyn from Brisbane completed Year 12 on an AIEF Scholarship at St Peters Lutheran College in 2017. Bradyn is currently studying at University in the field of Arts and Social Science. Tibau from Cairns completed Year 12 on an AIEF Scholarship at St Peters Lutheran College in 2017. Tibau is currently working in Farming, Agriculture and Aquaculture. Murray from St George completed Year 12 on an AIEF Scholarship at St Peters Lutheran College in 2017. Murray is currently studying at University in the field of Mathematics, Science and Research. Atima from Hammond Island completed Year 12 on an AIEF Scholarship at St Peters Lutheran College in 2017. Atima is currently working in Community Services and Development. Losa from Horn Island completed Year 12 on an AIEF Scholarship at St Saviour's College in 2017. Losa is currently working in Transport and Logistics. Sharna from Lilyfield completed Year 12 on an AIEF Scholarship at St Vincent's College, Potts Point in 2017. Sharna is currently working in Hospitality and Tourism. Jess from Walgett completed Year 12 on an AIEF Scholarship at St Vincent's College, Potts Point in 2017. Jess is currently studying at University in the field of Mathematics, Science and Research. Caitlin from Glebe completed Year 12 on an AIEF Scholarship at St Vincent's College, Potts Point in 2017. Caitlin is currently studying at University in the field of Arts and Social Science. 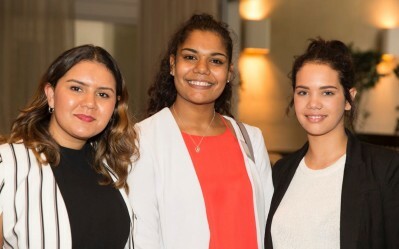 Kalarnna from Alice Springs completed Year 12 on an AIEF Scholarship at St Vincent's College, Potts Point in 2017. Kalarnna is currently working in Medicine. Jasmine from St Marys completed Year 12 on an AIEF Scholarship at St Vincent's College, Potts Point in 2017. Jasmine is currently studying at TAFE in the field of Farming, Agriculture and Aquaculture. Edward from Armidale completed Year 12 on an AIEF Scholarship at The Armidale School in 2017. Edward is currently working in Construction. Bailey from Armidale completed Year 12 on an AIEF Scholarship at The Armidale School in 2017. Bailey is currently working in Farming, Agriculture and Aquaculture. Tamera from Croydon (QLD) completed Year 12 on an AIEF Scholarship at The Cathedral School in 2017. Tamera is currently working in Farming, Agriculture and Aquaculture. Ramona from Yorke Island completed Year 12 on an AIEF Scholarship at The Cathedral School in 2017. Ramona is currently working in Energy, Mining and Resources. Kiara from Normanton completed Year 12 on an AIEF Scholarship at The Cathedral School in 2017. Kiara is currently studying at TAFE in the field of Community Services and Development. Shaylan from Palm Island completed Year 12 on an AIEF Scholarship at The Cathedral School in 2017. Shaylan is currently studying at University in the field of Accounting, Business and Financial Services. Orana from Wollongong completed Year 12 on an AIEF Scholarship at The Cathedral School in 2017. Orana is currently working in Energy, Mining and Resources at BHP. Lochlan from Nowra completed Year 12 on an AIEF Scholarship at The Scots College in 2017. Lochlan is currently working in Sports and Recreation. Ian from Northam completed Year 12 on an AIEF Scholarship at Wesley College, South Perth in 2017. Ian is currently working in Sports and Recreation. Nyah from Derby graduated from The University of Queensland on an AIEF-BHP Tertiary Scholarship in 2016. Nyah is currently working in Engineering at BHP. hris from Adelaide graduated from The University of Adelaide on an AIEF-BHP Tertiary Scholarship in 2016. Chris is currently working in Engineering at BHP. Phillip from Cairns completed Year 12 on an AIEF Scholarship at Brisbane Boys' College in 2016. Phillip is currently working in Hospitality and Tourism. Konama from Thursday Island completed Year 12 on an AIEF Scholarship at Brisbane Boys' College in 2016. Konama is currently studying at Registered Training Organisation in the field of Hospitality and Tourism. Zoe from Howard Springs completed Year 12 on an AIEF Scholarship at Clayfield College in 2016. Zoe is currently studying at University in the field of Accounting, Business and Financial Services. Eylania from Wynnum completed Year 12 on an AIEF Scholarship at Clayfield College in 2016. Eylania is currently studying at The University of Queensland in the field of Arts and Social Science on an AIEF Tertiary Scholarship. Myah from Kelvin Grove completed Year 12 on an AIEF Scholarship at Clayfield College in 2016. Myah is currently studying at University in the field of Arts and Social Science. Harrison from Bomaderry completed Year 12 on an AIEF Scholarship at Cranbrook School in 2016. Harrison is currently working in Education. Tehillah from Yorke Island completed Year 12 on an AIEF Scholarship at Ipswich Girls' Grammar School in 2016. Tehillah is currently working in Retail, Consumer Products and Services. Jamika from Charleville completed Year 12 on an AIEF Scholarship at Ipswich Girls' Grammar School in 2016. Jamika is currently working in Health and Health Science. Brendon from Margeret Bay completed Year 12 on an AIEF Scholarship at Ipswich Grammar School in 2016. Brendon is currently working in Construction. Ali from Palm Island completed Year 12 on an AIEF Scholarship at Ipswich Grammar School in 2016. Ali is currently working in Community Services and Development. Tyrone from Parkinson completed Year 12 on an AIEF Scholarship at Ipswich Grammar School in 2016. Tyrone is currently working in Construction. Lucas from Karama completed Year 12 on an AIEF Scholarship at Ipswich Grammar School in 2016. Lucas is currently studying at The University of Queensland in the field of Engineering on an AIEF Tertiary Scholarship. Walter from Margeret Bay completed Year 12 on an AIEF Scholarship at Ipswich Grammar School in 2016. Walter is currently working in Other Services. Barry from Mackay completed Year 12 on an AIEF Scholarship at Ipswich Grammar School in 2016. Barry is currently working in Construction. Henrick from Moree completed Year 12 on an AIEF Scholarship at Ipswich Grammar School in 2016. Henrick is currently working in Retail, Consumer Products and Services. Fredric from Taroom completed Year 12 on an AIEF Scholarship at Ipswich Grammar School in 2016. Fredric is currently studying at University in the field of Engineering. Bevan from Yungaburra completed Year 12 on an AIEF Scholarship at Ipswich Grammar School in 2016. Bevan is currently working in Construction. Mili from Stockton (NSW) completed Year 12 on an AIEF Scholarship at Kincoppal-Rose Bay School of the Sacred Heart in 2016. Mili is currently studying at University in the field of Communications and Media. Josef from Darwin completed Year 12 on an AIEF Scholarship at Melbourne Grammar School in 2016. Josef is currently studying at University in the field of Creative Arts. Ben from Darwin completed Year 12 on an AIEF Scholarship at Melbourne Grammar School in 2016. Ben is currently working in Sports and Recreation. Tahnee from Broome completed Year 12 on an AIEF Scholarship at Presbyterian Ladies' College, Perth in 2016. Tahnee is currently studying at University in the field of Health and Health Science. Jasmin from Mowanjum completed Year 12 on an AIEF Scholarship at Presbyterian Ladies' College, Perth in 2016. Jasmin is currently working in a Not for Profit. Isobella from Thursday Island completed Year 12 on an AIEF Scholarship at Presbyterian Ladies' College, Sydney in 2016. Isobella is currently studying at University in the field of Arts and Social Science. Cassie from Belyuen completed Year 12 on an AIEF Scholarship at Presbyterian Ladies' College, Sydney in 2016. Cassie is currently working in Administration and Office Support. Tayla from Moree completed Year 12 on an AIEF Scholarship at Pymble Ladies' College in 2016. Tayla is currently studying at University in the field of Arts and Social Science. Natalie from Malak completed Year 12 on an AIEF Scholarship at Pymble Ladies' College in 2016. Natalie is currently studying at University in the field of Engineering. Shannon from Darwin completed Year 12 on an AIEF Scholarship at Pymble Ladies' College in 2016. Shannon is currently studying at The University of Melbourne in the field of Arts and Social Science on an AIEF Tertiary Scholarship. Mary-Anne from Darwin completed Year 12 on an AIEF Scholarship at Pymble Ladies' College in 2016. Mary-Anne is currently working in Government and Emergency Services. Matthew from Paraburdoo completed Year 12 on an AIEF Scholarship at Scotch College, Perth in 2016. Matthew is currently working in Energy, Mining and Resources. Lau from Mowanjum completed Year 12 on an AIEF Scholarship at Scotch College, Perth in 2016. Lau is currently working in Hospitality and Tourism. Khysom from Port Hedland completed Year 12 on an AIEF Scholarship at Scotch College, Perth in 2016. Khysom is currently working in Energy, Mining and Resources. Zane from Bairnsdale completed Year 12 on an AIEF Scholarship at Scotch College, Melbourne in 2016. Zane is currently studying at University in the field of Construction. Jy from Mooroopna completed Year 12 on an AIEF Scholarship at Scotch College, Melbourne in 2016. Jy is currently working in Sports and Recreation. Dion from Illowa completed Year 12 on an AIEF Scholarship at Scotch College, Melbourne in 2016. Dion is currently working in Sports and Recreation. Jhdara from West Launceston completed Year 12 on an AIEF Scholarship at Scotch College, Melbourne in 2016. Jhdara is currently working in Sports and Recreation. Renee from Nowra graduated from Shalom College, The University of New South Wales on an AIEF-Shalom Gamarada Scholarship in 2016. Renee is currently working in Accounting, Business and Financial Services at Qantas. Marlon from Darnley Island completed Year 12 on an AIEF Scholarship at St Augustine's College in 2016. Marlon is currently working in Hospitality and Tourism. Tay from Thursday Island completed Year 12 on an AIEF Scholarship at St Augustine's College in 2016. Tay is currently studying at Registered Training Organisation in the field of Health and Health Science. Kobe from Thursday Island completed Year 12 on an AIEF Scholarship at St Augustine's College in 2016. Kobe is currently studying at RMIT University in the field of Health and Health Science on an AIEF Tertiary Scholarship. Tyrone from Faulconbridge completed Year 12 on an AIEF Scholarship at St Gregory's College Campbelltown in 2016. Tyrone is currently working in Hospitality and Tourism. Clancy from Muttama completed Year 12 on an AIEF Scholarship at St Gregory's College Campbelltown in 2016. Clancy is currently working in Farming, Agriculture and Aquaculture. Michael from Dubbo completed Year 12 on an AIEF Scholarship at St Gregory's College Campbelltown in 2016. Michael is currently studying at University in the field of Accounting, Business and Financial Services. Tim from Wellington completed Year 12 on an AIEF Scholarship at St Gregory's College Campbelltown in 2016. Tim is currently working in Farming, Agriculture and Aquaculture. Brett from Goonellabah completed Year 12 on an AIEF Scholarship at St Gregory's College Campbelltown in 2016. Brett is currently studying at University in the field of Arts and Social Science. Maia from Matraville completed Year 12 on an AIEF Scholarship at Saint Ignatius' College, Riverview in 2016. Maia is currently studying at University in the field of Arts and Social Science. Lachy from Cooroibah completed Year 12 on an AIEF Scholarship at St Joseph's Nudgee College in 2016. Lachy is currently working in Construction. Tyler from Chermside completed Year 12 on an AIEF Scholarship at St Joseph's Nudgee College in 2016. Tyler is currently working in Hospitality and Tourism. Lachlan from Gympie completed Year 12 on an AIEF Scholarship at St Joseph's Nudgee College in 2016. Lachlan is currently studying at University in the field of Creative Arts. ackson from Kingaroy completed Year 12 on an AIEF Scholarship at St Joseph's Nudgee College in 2016. Jackson is currently studying at University in the field of Mathematics, Science and Research. Brody from Goodooga completed Year 12 on an AIEF Scholarship at St Joseph's Nudgee College in 2016. Brody is currently working in Construction. Tyrell from Hervey Bay completed Year 12 on an AIEF Scholarship at St Joseph's Nudgee College in 2016. Tyrell is currently studying at University in the field of Sports and Recreation. athan from Brisbane completed Year 12 on an AIEF Scholarship at St Joseph's Nudgee College in 2016. Nathan is currently working in Defence. Joshua from Hervey Bay completed Year 12 on an AIEF Scholarship at St Joseph's Nudgee College in 2016. Joshua is currently studying at University in the field of Law and Justice. Tiga from Brisbane completed Year 12 on an AIEF Scholarship at St Joseph's Nudgee College in 2016. Tiga is currently working in Education. Tyrone from Chermside completed Year 12 on an AIEF Scholarship at St Joseph's Nudgee College in 2016. Tyrone is currently working in Construction. Gladys from Croydon (QLD) completed Year 12 on an AIEF Scholarship at St Monica's College, Cairns in 2016. Gladys is currently studying at The University of Queensland in the field of Engineering on an AIEF-BHP Tertiary Scholarship. Matt from Brisbane completed Year 12 on an AIEF Scholarship at St Peters Lutheran College in 2016. Matt is currently working in Construction. Gareth from Legume completed Year 12 on an AIEF Scholarship at St Peters Lutheran College in 2016. Gareth is currently studying at University in the field of Health and Health Science. Jacob from Legume completed Year 12 on an AIEF Scholarship at St Peters Lutheran College in 2016. Jacob is currently studying at University in the field of Engineering. Cathy from Innisfail completed Year 12 on an AIEF Scholarship at St Peters Lutheran College in 2016. Cathy is currently studying at University in the field of Health and Health Science. Mishelle from Horn Island completed Year 12 on an AIEF Scholarship at St Saviour's College in 2016. Mishelle is currently working in Construction. helsea from St George completed Year 12 on an AIEF Scholarship at St Saviour's College in 2016. Chelsea is currently working in Accounting, Business and Financial Services. Naikeza from Palm Island completed Year 12 on an AIEF Scholarship at St Saviour's College in 2016. Naikeza is currently working in Education. Sueling from Armidale completed Year 12 on an AIEF Scholarship at St Scholastica's College in 2016. Sueling is currently studying at TAFE in the field of Community Services and Development. Kaitlyn from Illabo completed Year 12 on an AIEF Scholarship at St Vincent's College, Potts Point in 2016. Kaitlyn is currently working in Early Childhood Education. Paula-Rose from Croydon (NSW) completed Year 12 on an AIEF Scholarship at St Vincent's College, Potts Point in 2016. Paula-Rose is currently studying at University in the field of Arts and Social Science. Joshua from Lightning Ridge completed Year 12 on an AIEF Scholarship at The Armidale School in 2016. Joshua is currently working in Retail, Consumer Products and Services. Dennis from Armidale completed Year 12 on an AIEF Scholarship at The Armidale School in 2016. Dennis is currently working in Hospitality and Tourism. Isabella from Katherine completed Year 12 on an AIEF Scholarship at The Cathedral School in 2016. Isabella is currently studying at University in the field of Farming, Agriculture and Aquaculture. Shenee from Pormpuraaw completed Year 12 on an AIEF Scholarship at The Cathedral School in 2016. Shenee is currently working in Community Services and Development. Douglas from Katherine completed Year 12 on an AIEF Scholarship at The Cathedral School in 2016. Douglas is currently working in Retail, Consumer Products and Services. Britney from Bowen completed Year 12 on an AIEF Scholarship at The Cathedral School in 2016. Britney is currently studying at University in the field of Nursing and Paramedicine. Jacob from La Perouse completed Year 12 on an AIEF Scholarship at The Scots College in 2016. Jacob is currently studying at University in the field of Accounting, Business and Financial Services. Delwyn (Delwin) from Gapuwiyak completed Year 12 on an AIEF Scholarship at The Scots College in 2016. Delwyn is currently working in Government and Emergency Services. Winston from Nhulunbuy completed Year 12 on an AIEF Scholarship at The Scots College in 2016. Winston is currently working in Farming, Agriculture and Aquaculture. Jesse from North Toowoomba completed Year 12 on an AIEF Scholarship at Clayfield College in 2015. Jesse is currently studying at University in the field of Health and Health Science. Edna from Palm Island completed Year 12 at Clayfield College in 2015 on an AIEF-CFF Scholarship. Since completing school Edna returned home and has been working in education spending her time volunteering at the local primary school. Matt from Nowra completed Year 12 on an AIEF Scholarship at Cranbrook School in 2015. Matt is currently studying at The University of Melbourne in the field of Arts and Social Science on an AIEF Tertiary Scholarship. Thomas from Roxby Downs completed Year 12 on an AIEF Scholarship at Ipswich Grammar School in 2015. Thomas is currently studying at The University of Sydney in the field of Mathematics, Science and Research on an AIEF-BHP Tertiary Scholarship. Joel from Taroom completed Year 12 on an AIEF Scholarship at Ipswich Grammar School in 2015. Joel is currently working in Retail, Consumer Products and Services. James from Mt Isa completed Year 12 on an AIEF Scholarship at Ipswich Grammar School in 2015. James is currently working in Health and Health Science. Ethan from Karama completed Year 12 on an AIEF Scholarship at Ipswich Grammar School in 2015. Ethan is currently working in Health and Health Science. Keinan from Darwin completed Year 12 on an AIEF Scholarship at Ipswich Grammar School in 2015. Keinan is currently working in Education. Brenton from Goondiwindi completed Year 12 on an AIEF Scholarship at Ipswich Grammar School in 2015. Brenton is currently working in Energy, Mining and Resources at BHP. Solomon from Mackay completed Year 12 on an AIEF Scholarship at Ipswich Grammar School in 2015. Solomon is currently studying at University in the field of Health and Health Science. Verle from Runcorn completed Year 12 on an AIEF Scholarship at Ipswich Grammar School in 2015. Verle is currently working in Hospitality and Tourism. Mitchell from Hope Vale completed Year 12 on an AIEF Scholarship at Ipswich Grammar School in 2015. Mitchell is currently studying at University in the field of Mathematics, Science and Research. Aidan from Weipa completed Year 12 at Ipswich Grammar School in 2015. Aidan is currently working in retail in Queensland and developing skills that will benefit him for the future. Daniel from Poruma (Coconut Island) completed Year 12 on an AIEF Scholarship at Ipswich Grammar School in 2015. Daniel is currently studying at TAFE in the field of Sports and Recreation. Pierce from Stradbroke Island completed Year 12 on an AIEF Scholarship at Ipswich Grammar School in 2015. Pierce is currently working in Hospitality and Tourism. Cooper from River Heads completed Year 12 on an AIEF Scholarship at Ipswich Grammar School in 2015. Cooper is currently working in Defence. Gab from Narromine completed Year 12 on an AIEF Scholarship at Kincoppal-Rose Bay School of the Sacred Heart in 2015. Gab is currently studying at University in the field of Arts and Social Science. Madi from Baldry completed Year 12 on an AIEF Scholarship at Kincoppal-Rose Bay School of the Sacred Heart in 2015. Madi is currently studying at University in the field of Architecture and Design. Tarley from Wallsend completed Year 12 on an AIEF Scholarship at Kincoppal-Rose Bay School of the Sacred Heart in 2015. Tarley is currently studying at Registered Training Organisation in the field of Law and Justice. Megan from Leeton completed Year 12 on an AIEF Scholarship at Kincoppal-Rose Bay School of the Sacred Heart in 2015. Megan is currently working in Manufacturing. Kayleb from Nowra completed Year 12 on an AIEF Scholarship at Knox Grammar School in 2015. Kayleb is currently working in Administration and Office Support. Drew from Worrigee completed Year 12 on an AIEF Scholarship at Knox Grammar School in 2015. Drew is currently working in Hospitality and Tourism. Troy from Prestons completed Year 12 on an AIEF Scholarship at Knox Grammar School in 2015. Troy is currently working in Sports and Recreation. Harrison from Dubbo completed Year 12 on an AIEF Scholarship at Knox Grammar School in 2015. Harrison is currently studying at University in the field of Health and Health Science. Andrew from Sandringham completed Year 12 on an AIEF Scholarship at Melbourne Grammar School in 2015. Andrew is currently studying at University in the field of Health and Health Science. Jacob from Darwin completed Year 12 on an AIEF Scholarship at Melbourne Grammar School in 2015. Jacob is currently studying at University in the field of Arts and Social Science. Keeley from Melbourne completed Year 12 on an AIEF Scholarship at Pymble Ladies' College in 2015. Keeley is currently studying at University in the field of Education. Lachlan from Leonora completed Year 12 on an AIEF Scholarship at Scotch College, Perth in 2015. Lachlan is currently working in Energy, Mining and Resources. Austin from Port Hedland completed Year 12 on an AIEF Scholarship at Scotch College, Perth in 2015. Austin is currently working in Energy, Mining and Resources. Aidyn from Echuca completed Year 12 on an AIEF Scholarship at Scotch College, Melbourne in 2015. Aidyn is currently working in Sports and Recreation. Mitch from Brisbane graduated from Shalom College, The University of New South Wales on an AIEF-Shalom Gamarada Scholarship in 2015. Mitch is currently working in Accounting, Business and Financial Services at Commonwealth Bank of Australia. Mitch from Devonport graduated from Shalom College, The University of New South Wales on an AIEF-Shalom Gamarada Scholarship in 2015. Mitch is currently working in Medicine. Sutchy from Thursday Island completed Year 12 on an AIEF Scholarship at St Augustine's College in 2015. Sutchy is currently working in Transport and Logistics. Jayden from Innisfail completed Year 12 on an AIEF Scholarship at St Augustine's College in 2015. Jayden is currently working in Construction. Trey from Alyangula completed Year 12 on an AIEF Scholarship at St Augustine's College in 2015. Trey is currently working in Administration and Office Support. Sibby from Griffith completed Year 12 on an AIEF Scholarship at St Catherine's School, Waverley in 2015. Sibby is currently studying at University of Technology, Sydney in the field of Health and Health Science on an AIEF Tertiary Scholarship. Joyce from Katherine completed Year 12 on an AIEF Scholarship at St Catherine's School, Waverley in 2015. Joyce is currently working in Community Services and Development. Zayden from Talarm completed Year 12 on an AIEF Scholarship at St Gregory's College Campbelltown in 2015. Zayden is currently working in Manufacturing. Charlie from Barmedman completed Year 12 on an AIEF Scholarship at St Gregory's College Campbelltown in 2015. Charlie is currently working in Farming, Agriculture and Aquaculture. Kyle from Dubbo completed Year 12 on an AIEF Scholarship at St Gregory's College Campbelltown in 2015. Kyle is currently studying at University in the field of Arts and Social Science. Harry from Wellington completed Year 12 on an AIEF Scholarship at St Gregory's College Campbelltown in 2015. Harry is currently studying at University in the field of Farming, Agriculture and Aquaculture. Elijah from Karama completed Year 12 on an AIEF Scholarship at St Joseph's Nudgee College in 2015. Elijah is currently working in Other Services. Lenny from Brisbane completed Year 12 on an AIEF Scholarship at St Joseph's Nudgee College in 2015. Lenny is currently working in Accounting, Business and Financial Services. Kevin from Darwin completed Year 12 on an AIEF Scholarship at St Joseph's Nudgee College in 2015. Kevin is currently working in Hospitality and Tourism. Coen from Birdsville completed Year 12 on an AIEF Scholarship at St Joseph's Nudgee College in 2015. Coen is currently working in Farming, Agriculture and Aquaculture. Benjamin from Bribie Island completed Year 12 on an AIEF Scholarship at St Joseph's Nudgee College in 2015. Benjamin is currently working in Mathematics, Science and Research. Unngoorra from Winton completed Year 12 on an AIEF Scholarship at St Joseph's Nudgee College in 2015. Unngoorra is currently studying at University in the field of Medicine. Jack from Townsville completed Year 12 on an AIEF Scholarship at St Joseph's Nudgee College in 2015. Jack is currently working in Construction. Samuel from Winton completed Year 12 on an AIEF Scholarship at St Joseph's Nudgee College in 2015. Samuel is currently working in Construction. Dexter from Longreach completed Year 12 at St Joseph’s Nudgee College in 2015 on an AIEF Scholarship. Currently Dexter is working in the mines gaining valuable experience that will benefit him in the future. Lindsay from Brisbane completed Year 12 on an AIEF Scholarship at St Joseph's Nudgee College in 2015. Lindsay is currently studying at Griffith University in the field of Accounting, Business and Financial Services on an AIEF Tertiary Scholarship. Ryan from Howard Springs completed Year 12 on an AIEF Scholarship at St Joseph's Nudgee College in 2015. Ryan is currently studying at University in the field of Engineering. Ford from Hervey Bay completed Year 12 on an AIEF Scholarship at St Peters Lutheran College in 2015. Ford is currently working in Retail, Consumer Products and Services. Nancy from Cairns completed Year 12 at St Peters Lutheran College in 2015 on an AIEF Scholarship. Nancy is currently undertaking a pre-employment training program through Australian Training Works in Cairns. Ebony from Mt Isa completed Year 12 at St Peter’s Lutheran College in 2015 on an AIEF Scholarship. In 2017 she returned to Mt Isa where she has been working full time. Kalina from Townsville completed Year 12 on an AIEF Scholarship at St Peters Lutheran College in 2015. Kalina is currently studying at University in the field of Medicine. James from Innisfail completed Year 12 on an AIEF Scholarship at St Peters Lutheran College in 2015. James is currently working in Sports and Recreation. Jacinta from Brisbane completed Year 12 on an AIEF Scholarship at St Peters Lutheran College in 2015. Jacinta is currently studying at University in the field of Law and Justice. Royston from Cairns completed Year 12 on an AIEF Scholarship at St Peters Lutheran College in 2015. Royston is currently working in Construction. Tyreece from Kempsey completed Year 12 at St Peters Lutheran College in 2015 on an AIEF Scholarship. Tyreee is currently employed as lead smelter at the mines in Mt Isa. Tahlia from Brisbane completed Year 12 on an AIEF Scholarship at St Peters Lutheran College in 2015. Tahlia is currently studying at University in the field of Engineering. Tjarra from Coffs Harbour completed Year 12 on an AIEF Scholarship at St Peters Lutheran College in 2015. Tjarra is currently working in Hospitality and Tourism. Celine from Home Hill completed Year 12 on an AIEF Scholarship at St Peters Lutheran College in 2015. Celine is currently studying at University in the field of Arts and Social Science. Klarindah from Melbourne completed Year 12 on an AIEF Scholarship at St Peters Lutheran College in 2015. Klarindah is currently working in Community Services and Development. Shaleise from Wondai completed Year 12 on an AIEF Scholarship at St Saviour's College in 2015. Shaleise is currently working in Hospitality and Tourism. 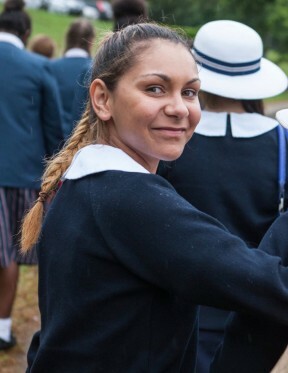 Tanika from Pormpuraaw completed Year 12 on an AIEF Scholarship at St Saviour's College in 2015. Tanika is currently working in Education. Rebekah from Dauan Island completed Year 12 on an AIEF Scholarship at St Saviour's College in 2015. Rebekah is currently working in Hospitality and Tourism. Penibo from Dauan Island completed Year 12 on an AIEF Scholarship at St Saviour's College in 2015. Penibo is currently working in Community Services and Development. Telcy from Dauan Island completed Year 12 on an AIEF Scholarship at St Saviour's College in 2015. Telcy is currently working in Community Services and Development. Sprhee from Cherbourg completed Year 12 on an AIEF Scholarship at St Saviour's College in 2015. Sprhee is currently working in Defence. Tyeisha from Walgett completed Year 12 on an AIEF Scholarship at St Scholastica's College in 2015. Tyeisha is currently working in Early Childhood Education. Teghan from Whalan completed Year 12 on an AIEF Scholarship at St Scholastica's College in 2015. Teghan is currently working in Other Services. Jaylyn from Petersham completed Year 12 at St Vincents College in 2015. In 2017 Jaylyn completed a Business Traineeship and has gained valuable skills that will benefit her future goals and employment prospects. Alice from Nyngan completed Year 12 on an AIEF Scholarship at St Vincent's College, Potts Point in 2015. Alice is currently working in Education. Indi from Umina Beach completed Year 12 on an AIEF Scholarship at St Vincent's College, Potts Point in 2015. Indi is currently studying at University in the field of Health and Health Science. Lachlan from Bowen completed Year 12 on an AIEF Scholarship at The Cathedral School in 2015. Lachlan is currently studying at The University of Queensland in the field of Engineering on an AIEF-BHP Tertiary Scholarship. Jaimee from Wollongong completed Year 12 on an AIEF Scholarship at The Cathedral School in 2015. Jaimee is currently studying at University in the field of Health and Health Science. Tilisha from Tully completed Year 12 on an AIEF Scholarship at The Cathedral School in 2015. Tilisha is currently studying at University in the field of Nursing and Paramedicine. Duncan from Croydon (QLD) completed Year 12 on an AIEF Scholarship at The Cathedral School in 2015. Duncan is currently working in Defence. Tyron from Pormpuraaw completed Year 12 on an AIEF Scholarship at The Cathedral School in 2015. Tyron is currently working in Construction. Alyssia from Normanton completed Year 12 on an AIEF Scholarship at The Cathedral School in 2015. Alyssia is currently working in Health and Health Science. Cheyenne from Croydon (QLD) completed Year 12 on an AIEF Scholarship at The Cathedral School in 2015. Cheyenne is currently working in Hospitality and Tourism. Dylan from Wagga Wagga completed Year 12 on an AIEF Scholarship at The Scots College in 2015. Dylan is currently working in Community Services and Development. Samuel from Mt Lawley completed Year 12 on an AIEF Scholarship at Wesley College, South Perth in 2015. Samuel is currently working in Sports and Recreation. Bryce from Mirrabooka completed Year 12 at Wesley College on an AIEF-BHP Billiton Scholarship in 2015. Bryce is currently working in the hospitality industry in Perth. Lowanna from Tregear completed Year 12 on an AIEF Scholarship at St Catherine's School, Waverley in 2010 and continued on to graduate from The University of New South Wales on an AIEF Tertiary Scholarship in 2014. Lowanna is currently working in Education. Carlie from Bowraville graduated from The University of New South Wales on an AIEF Tertiary Scholarship in 2014. Carlie is currently working in Law and Justice. Tim from Sydney graduated from The University of Sydney on an AIEF-BHP Tertiary Scholarship in 2014. Tim is currently working in Engineering. Lindsy from Saibai Island completed Year 12 on an AIEF Scholarship at Ipswich Grammar School in 2014. Lindsy is currently working in Construction. Matthew from Moree completed Year 12 on an AIEF Scholarship at Ipswich Grammar School in 2014. Matthew is currently working in Defence. Brannon from Woolgoolga completed Year 12 on an AIEF Scholarship at Ipswich Grammar School in 2014. Brannon is currently working in Construction. Gerrard from Redfern completed Year 12 on an AIEF Scholarship at Ipswich Grammar School in 2014. Gerrard is currently working in Automotive and Mechanical. Raymond from Karama completed Year 12 on an AIEF Scholarship at Ipswich Grammar School in 2014. Raymond is currently working in Government and Emergency Services. Ethan from Beaudesert completed Year 12 on an AIEF Scholarship at Ipswich Grammar School in 2014. Ethan is currently working in Construction. Bryce from Walgett completed Year 12 on an AIEF Scholarship at Ipswich Grammar School in 2014. Bryce is currently working in Hospitality and Tourism. Kane from Cairns completed Year 12 on an AIEF Scholarship at Ipswich Grammar School in 2014. Kane is currently working in Other Services. Allan from Charters Towers completed Year 12 on an AIEF Scholarship at Ipswich Grammar School in 2014. Allan is currently working in Retail, Consumer Products and Services. Connor from Avoca Beach completed Year 12 on an AIEF Scholarship at Knox Grammar School in 2014. Connor is currently working in Sports and Recreation. James (Jimmy) from Armidale completed Year 12 on an AIEF Scholarship at Knox Grammar School in 2014. Jimmy is currently working in Accounting, Business and Financial Services. Tegan from Lismore completed Year 12 on an AIEF Scholarship at Loreto Normanhurst Limited in 2014. Tegan is currently working in Community Services and Development. Tarne from Tamworth completed Year 12 on an AIEF Scholarship at Loreto Normanhurst Limited in 2014. Tarne is currently studying at University in the field of Education. Darnell from Murgon completed Year 12 on an AIEF Scholarship at Marist College Ashgrove in 2014. Darnell is currently working in Defence. Brady from Bairnsdale completed Year 12 on an AIEF Scholarship at Melbourne Grammar School in 2014. Brady is currently working in Hospitality and Tourism. Biama from Maroochydore completed Year 12 on an AIEF Scholarship at Pymble Ladies' College in 2014. Biama is currently working in Human Resources. Ebithia (Ebi) from Thursday Island completed Year 12 on an AIEF Scholarship at Pymble Ladies' College in 2014. Ebithia is currently working in Hospitality and Tourism. Andrea from Thursday Island completed Year 12 on an AIEF Scholarship at Pymble Ladies' College in 2014. Andrea is currently working in Retail, Consumer Products and Services. 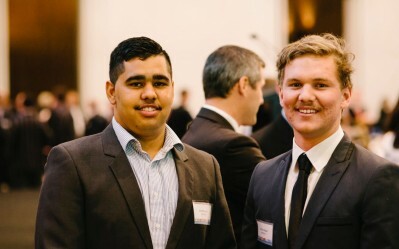 Ronald from Paraburdoo completed Year 12 on an AIEF Scholarship at Scotch College, Perth in 2014. Ronald is currently working in Energy, Mining and Resources. Jesse from Albany completed Year 12 on an AIEF Scholarship at Scotch College, Perth in 2014. Jesse is currently working in Architecture and Design. Laura from Canberra graduated from Shalom College, The University of New South Wales on an AIEF-Shalom Gamarada Scholarship in 2014. Laura is currently working in Medicine. Khyarne from Dubbo graduated from Shalom College, The University of New South Wales on an AIEF-Shalom Gamarada Scholarship in 2014. Khyarne is currently working in Medicine. Nelson from Thursday Island completed Year 12 on an AIEF Scholarship at St Augustine's College in 2014. Nelson is currently studying at The University of Melbourne in the field of Mathematics, Science and Research on an AIEF-BHP Tertiary Scholarship. Ewelu from Warraber Island completed Year 12 on an AIEF Scholarship at St Augustine's College in 2014. Ewelu is currently working in Community Services and Development. Ashley from Croydon (QLD) completed Year 12 on an AIEF Scholarship at St Augustine's College in 2014. Ashley is currently studying at The University of Queensland in the field of Engineering on an AIEF Tertiary Scholarship. Ishmaiel from Warraber Island completed Year 12 on an AIEF Scholarship at St Augustine's College in 2014. Ishmaiel is currently working in Defence. Josh from Cooma completed Year 12 on an AIEF Scholarship at St Gregory's College Campbelltown in 2014. Josh is currently studying at University in the field of Accounting, Business and Financial Services. Aidan from Wreck Bay completed Year 12 on an AIEF Scholarship at St Gregory's College Campbelltown in 2014. Aidan is currently working in Defence. Kalkani from Nhulunbuy completed Year 12 on an AIEF Scholarship at St Joseph's Nudgee College in 2014. Kalkani is currently studying at University in the field of Accounting, Business and Financial Services. Jerone from Palmerston completed Year 12 on an AIEF Scholarship at St Joseph's Nudgee College in 2014. Jerone is currently studying at Queensland University of Technology in the field of Law and Justice on an AIEF Internship Scholarship. Ketch from Thursday Island completed Year 12 on an AIEF Scholarship at St Joseph's Nudgee College in 2014. Ketch is currently working in Farming, Agriculture and Aquaculture. Bryson from Mitchelton completed Year 12 on an AIEF Scholarship at St Joseph's Nudgee College in 2014. Bryson is currently working in Farming, Agriculture and Aquaculture. Daniel from Darwin completed Year 12 at St Joseph’s Nudgee College in 2014 on an AIEF Scholarship. In 2015, Daniel commenced a Bachelor of Engineering at Queensland University of Technology in Brisbane and also participated in an Indigenous Rugby tour of the United State. In 2017 Daniel began his second year of an internship with international engineering company Arup, which he really enjoys. Kein from Bald Hills completed Year 12 on an AIEF Scholarship at St Joseph's Nudgee College in 2014. Kein is currently studying at University in the field of Accounting, Business and Financial Services. Joshua from Cooroibah completed Year 12 on an AIEF Scholarship at St Joseph's Nudgee College in 2014. Joshua is currently working in Education. Phillip from Wulagi completed Year 12 on an AIEF Scholarship at St Joseph's Nudgee College in 2014. Phillip is currently studying at University in the field of ICT and Telecommunications. Tristan from Lockhart (QLD) completed Year 12 on an AIEF Scholarship at St Joseph's Nudgee College in 2014. Tristan is currently working in Construction. Tyrone from Kirwan completed Year 12 on an AIEF Scholarship at St Joseph's Nudgee College in 2014. Tyrone is currently working in Community Services and Development. Jesse from Kempsey completed Year 12 on an AIEF Scholarship at St Joseph's Nudgee College in 2014. Jesse is currently working in Construction. Daniel from Darwin completed Year 12 at St Joseph’s Nudgee College in 2014 on an AIEF Scholarship. In 2015, Daniel was accepted into the Bachelor of Justice at the Queensland University of Technology in Brisbane, which he deferred in order to take a gap year. Daniel commenced his studies in 2016, and is completing his degree via distance education from Darwin. Daniel aspires to become a federal policeman. In his spare time, Daniel is an amateur boxer, who has competed at State and National Championships. Robert from Goodooga completed Year 12 on an AIEF Scholarship at St Joseph's Nudgee College in 2014. Robert is currently working in Farming, Agriculture and Aquaculture. Bradley from New Mapoon completed Year 12 on an AIEF Scholarship at St Joseph's Nudgee College in 2014. Bradley is currently working in Energy, Mining and Resources. Brayden from Tiwi Islands completed Year 12 on an AIEF Scholarship at St Joseph's Nudgee College in 2014. Brayden is currently working in Creative Arts. Christy-Lee from Townsville completed Year 12 at St Peters Lutheran College in 2014 on an AIEF Scholarship. Christy-Lee is currently living in her home community and in 2017 she gave birth to her first child. Daijah from Cairns completed Year 12 on an AIEF Scholarship at St Peters Lutheran College in 2014. Daijah is currently working in Accounting, Business and Financial Services. Kai from Cairns completed Year 12 on an AIEF Scholarship at St Peters Lutheran College in 2014. Kai is currently working in Administration and Office Support. Shanice from Tweed Heads completed Year 12 on an AIEF Scholarship at St Peters Lutheran College in 2014. Shanice is currently studying at The University of Queensland in the field of Education on an AIEF Tertiary Scholarship. Denzel from Cairns completed Year 12 on an AIEF Scholarship at St Peters Lutheran College in 2014. Denzel is currently working in Hospitality and Tourism. Shiane from Townsville completed Year 12 on an AIEF Scholarship at St Peters Lutheran College in 2014. Shiane is currently studying at TAFE in the field of Education. Sharna from Gunn completed Year 12 on an AIEF Scholarship at St Saviour's College in 2014. Sharna is currently studying at University in the field of Health and Health Science. Paiton from Mitchell completed Year 12 on an AIEF Scholarship at St Saviour's College in 2014. Paiton is currently working in Farming, Agriculture and Aquaculture. Adimin from Dauan Island completed Year 12 on an AIEF Scholarship at St Saviour's College in 2014. Adimin is currently working in Administration and Office Support. Ngtali from Dugandan completed Year 12 on an AIEF Scholarship at St Saviour's College in 2014. Ngtali is currently working in Energy, Mining and Resources. Zieha from Walgett completed Year 12 on an AIEF Scholarship at St Vincent's College, Potts Point in 2014. Zieha is currently working in Education. Nyari from Lilyfield completed Year 12 on an AIEF Scholarship at St Vincent's College, Potts Point in 2014. Nyari is currently studying at University in the field of Other Services. Hannah from Bombala completed Year 12 on an AIEF Scholarship at St Vincent's College, Potts Point in 2014 and continued on to graduate from University of Technology, Sydney on an AIEF Tertiary Scholarship in 2018. Hannah is currently working in Community Services and Development. Wesley (Debrize) from Dauan Island completed Year 12 on an AIEF Scholarship at The Cathedral School in 2014. Wesley is currently working in Energy, Mining and Resources. Moewaiya from Palm Island completed Year 12 on an AIEF Scholarship at The Cathedral School in 2014. Moewaiya is currently working in Administration and Office Support. Gabriella from Dauan Island completed Year 12 at The Cathedral School in 2014 on an AIEF Scholarship. Since completing Year 12 Gabriella has been employed in a variety of roles within the retail and business fields. In 2017 Gabriella commenced employment in a utilities role for a Rio Tinto Iron Ore mine near Karratha in WA. Alison from Normanton completed Year 12 on an AIEF Scholarship at The Cathedral School in 2014. Alison is currently working in Community Services and Development. Jackson from Port Macquarie completed Year 12 on an AIEF Scholarship at The Scots College in 2014 and continued on to graduate from The University of Sydney on an AIEF Tertiary Scholarship in 2017. Jackson is currently working in Nursing and Paramedicine. Ethan from Yalgoo completed Year 12 on an AIEF Scholarship at Aquinas College in 2013. Ethan is currently working in Farming, Agriculture and Aquaculture. Koree from Newman completed Year 12 on an AIEF Scholarship at Aquinas College in 2013. Koree is currently working in Energy, Mining and Resources. Chloe from Mornington Island completed Year 12 on an AIEF Scholarship at Clayfield College in 2013. Chloe is currently working in Early Childhood Education. Toa from Saibai Island completed Year 12 on an AIEF Scholarship at Ipswich Grammar School in 2013. Toa is currently working in Automotive and Mechanical. Daniel from Cunnamulla completed Year 12 on an AIEF Scholarship at Ipswich Grammar School in 2013. Daniel is currently working in Construction. Carlin from Stradbroke Island completed Year 12 on an AIEF Scholarship at Ipswich Grammar School in 2013. Carlin is currently working in Sports and Recreation. Gerald from Jervis Island completed Year 12 at Ipswich Grammar School in 2013 on an AIEF scholarship. Since completing school Gerald has relocated to the Cape and would like to find an apprenticeship in a field where he can work with his hands, in the areas of diesel fitting or mechanics. Tarryn from Nowra completed Year 12 on an AIEF Scholarship at Kincoppal-Rose Bay School of the Sacred Heart in 2013. Tarryn is currently working in Hospitality and Tourism. Shannon from Worrigee completed Year 12 on an AIEF Scholarship at Knox Grammar School in 2013. Shannon is currently working in Manufacturing. William from Balgo completed Year 12 on an AIEF Scholarship at La Salle College in 2013. William is currently working in Construction. Jerome from Sunset completed Year 12 on an AIEF Scholarship at Marist College Ashgrove in 2013. Jerome is currently studying at University in the field of Government and Emergency Services. Samuel from Stradbroke Island completed Year 12 on an AIEF Scholarship at Marist College Ashgrove in 2013. Samuel is currently working in Construction. Leslie from Yarrabah completed Year 12 on an AIEF Scholarship at Marist College Ashgrove in 2013. Leslie is currently working in Community Services and Development. Bernard from Darwin completed Year 12 on an AIEF Scholarship at Melbourne Grammar School in 2013 and continued on to graduate from The University of Melbourne on an AIEF Tertiary Scholarship in 2018. Bernard is currently working in ICT and Telecommunications. Nathan from Shepparton completed Year 12 on an AIEF Scholarship at Melbourne Grammar School in 2013. Nathan is currently working in Sports and Recreation. Lachlan from Shepparton completed Year 12 on an AIEF Scholarship at Melbourne Grammar School in 2013. Lachlan is currently studying at Monash University in the field of Arts and Social Science on an AIEF Internship Scholarship. Avea from Thursday Island completed Year 12 on an AIEF Scholarship at Presbyterian Ladies' College, Sydney in 2013. Avea is currently working in Mathematics, Science and Research. Ally from Ellalong completed Year 12 on an AIEF Scholarship at Pymble Ladies' College in 2013. Ally is currently working in Human Resources. Mikey from Redlynch completed Year 12 on an AIEF Scholarship at Pymble Ladies' College in 2013. Mikey is currently studying at University of Technology, Sydney in the field of Health and Health Science on an AIEF Tertiary Scholarship. Broden from Longreach completed Year 12 on an AIEF Scholarship at St Augustine's College in 2013. Broden is currently working in Construction. Katie from Mungindi completed Year 12 on an AIEF Scholarship at St Catherine's School, Waverley in 2013. Katie is currently studying at University in the field of Sports and Recreation. Matt from Nyngan completed Year 12 on an AIEF Scholarship at St Gregory's College Campbelltown in 2013. Matt is currently working in Energy, Mining and Resources. Brett from Kempsey completed Year 12 on an AIEF Scholarship at St Gregory's College Campbelltown in 2013. Brett is currently working in Construction. Gary from Griffith completed Year 12 on an AIEF Scholarship at St Gregory's College Campbelltown in 2013. Gary is currently working in Farming, Agriculture and Aquaculture. Junior from Brisbane completed Year 12 on an AIEF Scholarship at St Gregory's College Campbelltown in 2013. Junior is currently working in Construction. Trae from Wagga Wagga completed Year 12 on an AIEF Scholarship at St Joseph's Nudgee College in 2013. Trae is currently working in Community Services and Development. Joel from Toowoomba completed Year 12 on an AIEF Scholarship at St Joseph's Nudgee College in 2013. Joel is currently working in Education. Ryan from Kingaroy completed Year 12 on an AIEF Scholarship at St Joseph's Nudgee College in 2013. Ryan is currently working in Hospitality and Tourism. Freddie from Malak completed Year 12 on an AIEF Scholarship at St Joseph's Nudgee College in 2013. Freddie is currently working in Energy, Mining and Resources. Jordan from North Lakes completed Year 12 on an AIEF Scholarship at St Joseph's Nudgee College in 2013. Jordan is currently working in Manufacturing. Bailey from Toowoomba completed Year 12 on an AIEF Scholarship at St Joseph's Nudgee College in 2013. Bailey is currently working in Medicine. Keneen from Townsville completed Year 12 on an AIEF Scholarship at St Joseph's Nudgee College in 2013. Keneen is currently working in Construction. Jabryah from Anula completed Year 12 on an AIEF Scholarship at St Joseph's Nudgee College in 2013. Jabryah is currently working in Construction. Joshua from Buderim completed Year 12 on an AIEF Scholarship at St Joseph's Nudgee College in 2013. Joshua is currently working in Creative Arts. Shaun from Yamba completed Year 12 on an AIEF Scholarship at St Peters Lutheran College in 2013. Shaun is currently working in Other Services. Jonah from Moura completed Year 12 on an AIEF Scholarship at St Peters Lutheran College in 2013. Jonah is currently working in Farming, Agriculture and Aquaculture. Linton from Cairns completed Year 12 on an AIEF Scholarship at St Peters Lutheran College in 2013. Linton is currently working in Education. Travis from Cairns completed Year 12 on an AIEF Scholarship at St Peters Lutheran College in 2013. Travis is currently working in Construction. Moses from Yam Island completed Year 12 on an AIEF Scholarship at St Peters Lutheran College in 2013. Moses is currently working in Sports and Recreation. Tamika from Townsville completed Year 12 on an AIEF Scholarship at St Peters Lutheran College in 2013. Tamika is currently working in Retail, Consumer Products and Services. Taylor from Cairns completed Year 12 on an AIEF Scholarship at St Peters Lutheran College in 2013. Taylor is currently studying at University in the field of Accounting, Business and Financial Services. Ikaika from Cairns completed Year 12 on an AIEF Scholarship at St Peters Lutheran College in 2013. Ikaika is currently working in Education. Nikayla from Kempsey completed Year 12 on an AIEF Scholarship at St Peters Lutheran College in 2013. Nikayla is currently working in Administration and Office Support. Wazana from Gracemere completed Year 12 at St Saviour’s College in 2013 on an AIEF scholarship. She is a proud mother and looking to work in the mining industry. Miranda from Cherbourg completed Year 12 on an AIEF Scholarship at St Saviour's College in 2013. Miranda is currently working in Communications and Media. Taylah from Birdsville completed Year 12 on an AIEF Scholarship at St Saviour's College in 2013. Taylah is currently working in Early Childhood Education. Molly from St George completed Year 12 on an AIEF Scholarship at St Saviour's College in 2013. Molly is currently working in Farming, Agriculture and Aquaculture. Whitley from Cherbourg completed Year 12 on an AIEF Scholarship at St Saviour's College in 2013. Whitley is currently working in Hospitality and Tourism. Ashlee from Thargomindah completed Year 12 on an AIEF Scholarship at St Saviour's College in 2013. Ashlee is currently working in Administration and Office Support. Lakaree from Kempsey completed Year 12 on an AIEF Scholarship at St Scholastica's College in 2013. Lakaree is currently working in Accounting, Business and Financial Services. Terri from Griffith completed Year 12 on an AIEF Scholarship at St Scholastica's College in 2013. Terri is currently studying at University in the field of Nursing and Paramedicine. Morgan from Zetland completed Year 12 on an AIEF Scholarship at St Vincent's College, Potts Point in 2013. Morgan is currently studying at University in the field of Creative Arts. Jola from Binalong completed Year 12 on an AIEF Scholarship at St Vincent's College, Potts Point in 2013. Jola is currently studying at The University of Sydney in the field of Education on an AIEF Tertiary Scholarship. Ellen from Dubbo completed Year 12 on an AIEF Scholarship at St Vincent's College, Potts Point in 2013 and continued on to graduate from Australian Catholic Univeristy (Canberra) on an AIEF Tertiary Scholarship in 2018. Ellen is currently working in Health and Health Science. Dennis from Weipa completed Year 12 on an AIEF Scholarship at The Cathedral School in 2013. Dennis is currently working in Automotive and Mechanical. Summer from Branyan completed Year 12 on an AIEF Scholarship at The Cathedral School in 2013. Summer is currently working in Mathematics, Science and Research. Jarrod from Croydon (QLD) completed Year 12 on an AIEF Scholarship at The Cathedral School in 2013. Jarrod is currently working in Construction. Isa from Boigu Island completed Year 12 on an AIEF Scholarship at The Cathedral School in 2013. Isa is currently studying at University in the field of Community Services and Development. Elijah from Innisfail completed Year 12 on an AIEF Scholarship at The Cathedral School in 2013. Elijah is currently studying at University in the field of Education. Daniel from Dauan Island completed Year 12 on an AIEF Scholarship at The Cathedral School in 2013. Daniel is currently working in Defence. Isaiah from Thornleigh completed Year 12 on an AIEF Scholarship at The Scots College in 2013. Isaiah is currently working in Retail, Consumer Products and Services. Vayda from Casuarina completed Year 12 on an AIEF Scholarship at Clayfield College in 2012. Vayda is currently working in Health and Health Science. Claudia from Aurukun completed Year 12 on an AIEF Scholarship at Clayfield College in 2012. Claudia is currently working in Creative Arts. Justin from Chinchilla completed Year 12 on an AIEF Scholarship at Ipswich Grammar School in 2012 and continued on to graduate from University of Southern Queensland on an AIEF Tertiary Scholarship in 2018. Justin is currently working in Communications and Media. Willhelm from Cairns completed Year 12 on an AIEF Scholarship at Ipswich Grammar School in 2012. Willhelm is currently working in Construction. Shaquel from Weipa completed Year 12 on an AIEF Scholarship at Ipswich Grammar School in 2012. Shaquel is currently working in Construction. Lloyd from Woolgoolga completed Year 12 on an AIEF Scholarship at Ipswich Grammar School in 2012. Lloyd is currently working in Other Services. Dylan from Eidsvold completed Year 12 on an AIEF Scholarship at Ipswich Grammar School in 2012. Dylan is currently working in Energy, Mining and Resources. Sarah from Broome completed Year 12 on an AIEF Scholarship at Loreto Normanhurst Limited in 2012. Sarah is currently studying at Macquarie University in the field of Education on an AIEF Tertiary Scholarship. Nathan from Yarrabah completed Year 12 on an AIEF Scholarship at Marist College Ashgrove in 2012. Nathan is currently working in Automotive and Mechanical. Skye from Port Hedland completed Year 12 on an AIEF Scholarship at Presbyterian Ladies' College, Perth in 2012. Skye is currently working in Communications and Media. Olivia from Charlestown completed Year 12 on an AIEF Scholarship at Presbyterian Ladies' College, Sydney in 2012. Olivia is currently working in Accounting, Business and Financial Services. Bronte from Hamilton completed Year 12 on an AIEF Scholarship at Presbyterian Ladies' College, Sydney in 2012. Bronte is currently working in Health and Health Science. Ella from Terrigal completed Year 12 on an AIEF Scholarship at Pymble Ladies' College in 2012. Ella is currently working in Education. Colin from Mabuiag Island completed Year 12 on an AIEF Scholarship at St Augustine's College in 2012. Colin is currently working in Engineering. Nichollas from Saibai Island completed Year 12 on an AIEF Scholarship at St Augustine's College in 2012. Nichollas is currently working in Defence. Brittannie from Waterloo completed Year 12 on an AIEF Scholarship at St Catherine's School, Waverley in 2012. Brittannie is currently working in Community Services and Development. Chris from Marrar completed Year 12 on an AIEF Scholarship at St Gregory's College Campbelltown in 2012 and continued on to graduate from The University of Sydney on an AIEF Tertiary Scholarship in 2017. Chris is currently working in Accounting, Business and Financial Services at HSBC Bank Australia Limited. Jack from Bundaberg completed Year 12 on an AIEF Scholarship at St Joseph's Nudgee College in 2012. Jack is currently working in Communications and Media. Robert from Darwin completed Year 12 on an AIEF Scholarship at St Joseph's Nudgee College in 2012. Robert is currently working in Defence. Assan from Bamaga completed Year 12 on an AIEF Scholarship at St Joseph's Nudgee College in 2012. Assan is currently working in Construction. Tyrone from Bundaberg completed Year 12 on an AIEF Scholarship at St Joseph's Nudgee College in 2012. Tyrone is currently working in Engineering. Jayden from Darwin completed Year 12 on an AIEF Scholarship at St Joseph's Nudgee College in 2012. Jayden is currently working in Retail, Consumer Products and Services. Samson from Brisbane completed Year 12 on an AIEF Scholarship at St Joseph's Nudgee College in 2012. Samson is currently working in Engineering. Connie from Canberra completed Year 12 on an AIEF Scholarship at St Scholastica's College in 2012. Connie is currently working in Education. Brearna from Coomba Park completed Year 12 on an AIEF Scholarship at St Vincent's College, Potts Point in 2012. Brearna is currently working in Administration and Office Support. Marclene from Dauan Island completed Year 12 on an AIEF Scholarship at The Cathedral School in 2012. Marclene is currently working in Education. Layla from Normanton completed Year 12 at The Cathedral School in 2012 on an AIEF Scholarship. Layla has returned to her home community where she resides with her two children and partner. Sania from Mabuiag Island completed Year 12 at The Cathedral School in 2012 on an AIEF Scholarship. Sania became a proud mother in 2014 and is enjoying the responsibilities of raising her child. Billy-Joe from Tully completed Year 12 on an AIEF Scholarship at The Cathedral School in 2012. Billy-Joe is currently working in Farming, Agriculture and Aquaculture. Taylor from Bowraville completed Year 12 on an AIEF Scholarship at Kincoppal-Rose Bay School of the Sacred Heart in 2011. Taylor is currently studying at University in the field of Education. Kygim from Kempsey completed Year 12 on an AIEF Scholarship at Kincoppal-Rose Bay School of the Sacred Heart in 2011. Kygim is currently working in Law and Justice. Tanika from Forster completed Year 12 on an AIEF Scholarship at Kincoppal-Rose Bay School of the Sacred Heart in 2011. Tanika is currently working in Health and Health Science. Zanamarica from South Hedland completed Year 12 on an AIEF Scholarship at La Salle College in 2011. Zanamarica is currently working in Health and Health Science. Synarah from Port Hedland completed Year 12 on an AIEF Scholarship at La Salle College in 2011. Synarah is currently studying at University in the field of Communications and Media. Charlie from Mornington Island completed Year 12 on an AIEF Scholarship at Marist College Ashgrove in 2011. Charlie is currently working in Sports and Recreation. Benji from St George completed Year 12 on an AIEF Scholarship at Marist College Ashgrove in 2011. Benji is currently working in Other Services. Katelyn from Bowral completed Year 12 on an AIEF Scholarship at Presbyterian Ladies' College, Sydney in 2011. Katelyn is currently studying at University in the field of Law and Justice. Libby from Bungalow completed Year 12 on an AIEF Scholarship at Pymble Ladies' College in 2011. Libby is currently studying at Shalom College, The University of New South Wales in the field of Law and Justice on an AIEF-Shalom Gamarada Scholarship. Jacob from Newman completed Year 12 at Scotch College, Perth in 2011 on an AIEF-BHP Scholarship. In 2017 Jacob spent time in Port Hedland and worked part time for a delivery service and is looking to secure employment in Perth before recommencing a Bachelor of Science at The University of Western Australia in 2018. Josef from Newcastle graduated from Shalom College, The University of New South Wales on an AIEF-Shalom Gamarada Scholarship in 2011. Josef is currently working in Medicine. Demi from Wreck Bay completed Year 12 on an AIEF Scholarship at St Catherine's School, Waverley in 2011. Demi is currently studying at University in the field of Nursing and Paramedicine. Mullie from Cherbourg completed Year 12 on an AIEF Scholarship at St Joseph's Nudgee College in 2011. Mullie is currently working in Construction. Bodean from Innisfail completed Year 12 on an AIEF Scholarship at St Joseph's Nudgee College in 2011. Bodean is currently working in Energy, Mining and Resources. Anthony from Darwin completed Year 12 on an AIEF Scholarship at St Joseph's Nudgee College in 2011. Anthony is currently working in Defence. Dylan from Darnley Island completed Year 12 on an AIEF Scholarship at St Joseph's Nudgee College in 2011. Dylan is currently working in Government and Emergency Services. Morley from Darwin completed Year 12 on an AIEF Scholarship at St Joseph's Nudgee College in 2011. Morley is currently working in Other Services. Jemmason from Bowen completed Year 12 on an AIEF Scholarship at St Peters Lutheran College in 2011. Jemmason is currently working in Education. Eddie from Edge Hill completed Year 12 on an AIEF Scholarship at St Peters Lutheran College in 2011. Eddie is currently working in Transport and Logistics. Carmelitta from Eulo completed Year 12 on an AIEF Scholarship at St Saviour's College in 2011. Carmelitta is currently working in Energy, Mining and Resources. Kiah from Mackay completed Year 12 on an AIEF Scholarship at St Saviour's College in 2011. Kiah is currently working in Education. Mariah from Cherbourg completed Year 12 on an AIEF Scholarship at St Saviour's College in 2011. Mariah is currently working in Accounting, Business and Financial Services. Kelly from Cunnamulla graduated from St Saviour’s College in 2011 on an AIEF scholarship. Since completing school Kelly has worked in various roles from Retail to Farming and in 2017 was successful in a position working in the community services sector in the Darling Downs region. Ginau from Dauan Island completed Year 12 on an AIEF Scholarship at The Cathedral School in 2011. Ginau is currently working in Mathematics, Science and Research. Kristyn from Palm Island completed Year 12 on an AIEF Scholarship at Columba Catholic College in 2010. Kristyn is currently working in Administration and Office Support. Karina from Bowraville completed Year 12 on an AIEF Scholarship at Kincoppal-Rose Bay School of the Sacred Heart in 2010. Karina is currently studying at University in the field of Early Childhood Education. Keiryn from Innisfail completed Year 12 on an AIEF Scholarship at Pymble Ladies' College in 2010. Keiryn is currently studying at University in the field of Sports and Recreation. Jessica from Alice Springs completed Year 12 on an AIEF Scholarship at Pymble Ladies' College in 2010. Jessica is currently studying at University in the field of Medicine. Neerim from Normanton completed Year 12 on an AIEF Scholarship at St Augustine's College in 2010. Neerim is currently studying at The University of Melbourne in the field of Health and Health Science on an AIEF Tertiary Scholarship. Brylie from Forster completed Year 12 on an AIEF Scholarship at St Catherine's School, Waverley in 2010 and continued on to graduate from Shalom College, The University of New South Wales on an AIEF-Shalom Gamarada Scholarship in 2017. Brylie is currently working in Medicine. 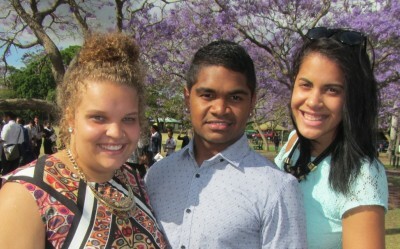 Blair from Aurukun completed Year 12 on an AIEF Scholarship at St Joseph's Nudgee College in 2010. Blair is currently working in Retail, Consumer Products and Services. Tom from Brisbane completed Year 12 on an AIEF Scholarship at St Joseph's Nudgee College in 2010. Tom is currently working in Defence. Peter from Freshwater completed Year 12 on an AIEF Scholarship at St Peters Lutheran College in 2010. Peter is currently working in Sports and Recreation at AFL Queensland Limited. Don from Yam Island completed Year 12 on an AIEF Scholarship at St Peters Lutheran College in 2010. Don is currently working in Transport and Logistics at Qantas. Frank from Cairns completed Year 12 on an AIEF Scholarship at St Peters Lutheran College in 2010. Frank is currently working in Accounting, Business and Financial Services. Emma from Cunnamulla completed Year 12 on an AIEF Scholarship at St Saviour's College in 2010. Emma is currently studying at Central Queensland University in the field of Nursing and Paramedicine on an AIEF Tertiary Scholarship. Keewa from Maclean completed Year 12 on an AIEF Scholarship at St Scholastica's College in 2010. Keewa is currently working in Education. Henrietta from Moree completed Year 12 on an AIEF Scholarship at St Scholastica's College in 2010 and continued on to graduate from The University of Sydney on an AIEF Tertiary Scholarship in 2017. Henrietta is currently working in Law and Justice. Tara from Illabo completed Year 12 on an AIEF Scholarship at St Vincent's College, Potts Point in 2010. Tara is currently working in Education. Alick from Dauan Island completed Year 12 on an AIEF Scholarship at The Cathedral School in 2010. Alick is currently working in Energy, Mining and Resources. Steven from Thursday Island completed Year 12 on an AIEF Scholarship at The Cathedral School in 2010. Steven is currently working in Construction. Katie from Dubbo completed Year 12 on an AIEF Scholarship at St Catherine's School, Waverley in 2009. Katie is currently working in Automotive and Mechanical. Receiving the scholarship has allowed me to get a top quality education which has opened so many doors for me and most importantly enabled me to go on to study at university, one step closer to my dream of becoming a lawyer.